I used to go to great lengths to make sure every present I gave was handmade and tailored to the recipient's taste. Over the last few years, I've realized that most people truly love to receive a gift card now & then, so they can go out and get the very thing they've been hoping for. This has been an adjustment for me. I felt kind of guilty about the first few gift cards I gave, like I didn't put enough time into it. But, as the reactions were genuinely enthusiastic, I thought, 'well, that was easy' and I decided that gift cards can be very good. There's always one or two people on my gift list who gift cards are perfect for. Like my dad. I never know what to do for my dad. My sister, Julia, has pulled off some well-chosen shirts or gardening books for him, but I'm always stumped. My most successful handmade present for him to date was a custom-designed table mat for he and my mom to play cards on. They love that thing. Who would have known? I've certainly made things that were cooler than that, like a hand-cut, metal bookmark that looks like a man climbing over the page when in place. Crazy stuff sometimes. I'm much more excited about planning gifts for my dad now that I'm cool with gift cards as a safety net. What seals the deal for me is that I can still make the box. 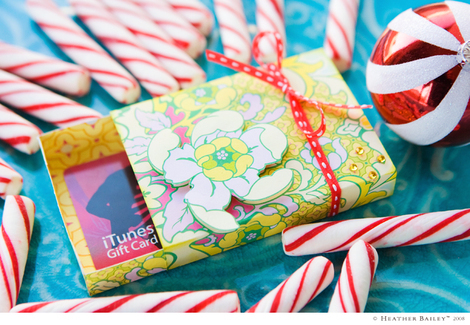 For my recent feature in Creating Keepsakes (Dec 08), I designed a free pattern for the gift card box shown above. 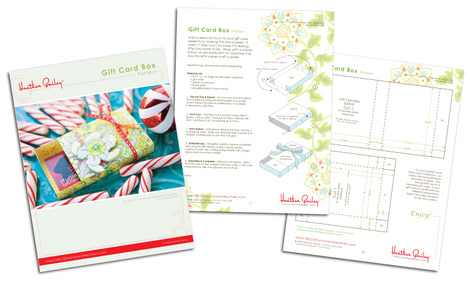 If you are planning to give some gift cards and would like to dress them up a bit, head to the pattern download page or follow the 'Gift Card Box' link under 'Free Patterns' in my sidebar. These little boxes are great for wrapping up buttons, jewelry or candy too -- or for housing a love note on top of a larger, wrapped gift. Get creative.